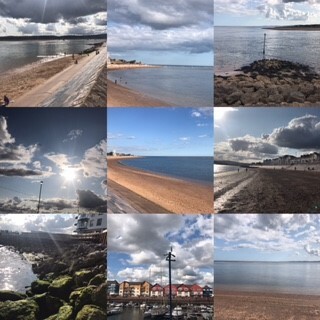 I chose Exmouth because there was plenty to do in case of inclement weather – which there was plenty of. A nice mixture of quaint tearooms, tacky seaside shops and gastro pubs means there is something for everyone. 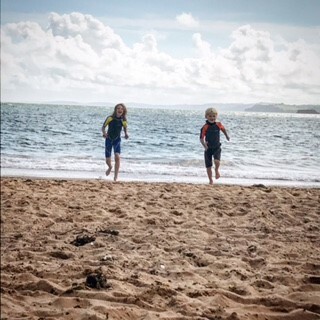 A cinema and leisure centre with a climbing wall (the children’s favourite) plus a long sandy beach with all the usual attractions and plenty of tourist boat rides. The highlight of the trip as far as the children were concerned was the crabbing. 2 nets @ £2.95 and a bucket @ £2.45 plus daily bait was the best money I spent apart from the mini bottles of wine in plastic bottles to drink on the beach! 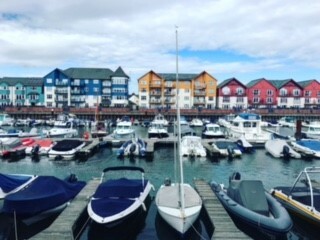 Go for a coffee and cake to http://www.thepointbarandgrill.com where you can watch the children crabbing off the quay whilst relaxing with the morning papers. 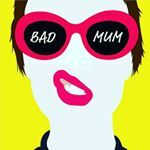 Being by myself with an 11 and 7 year old for 5 days – I was obviously starved of adult company – I called my husband at least 7 times a day – apparently I only want to talk to him when I am away!!! Exmouth does offer so many things to do that you really can amuse yourselves for hours each day. 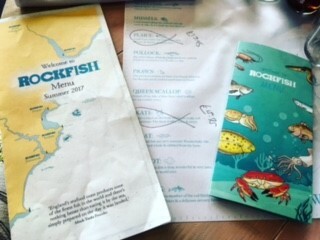 Dinner – Rockfish https://www.therockfish.co.uk We booked here as it was new, fancy and had a great Trip Advisor review (all things I look for ) A 7.30pm table for an adult and 2 children on a very rainy night on the “terrace” – much to my delight the “terrace” was actually completely covered if needed and was toasty warm. Our waitress was especially lovely – she had all the knowledge required to make excellent recommendations of the fresh fish they had on the menu that evening without me feeling as though she was up selling me the priciest option. The children were thoroughly entertained by the manager and his kid’s packs – activity book, pack of cards, pencils, keyring, wallet and stickers (better than your average pizza place!) We went for – Crispy calamari with chilli sauce, 6 local oysters, children’s grilled cod with unlimited chips twice, local skate, two ice cream sundaes, two apple juices, a 2015 Rioja and an Irish coffee – all for £60 ish – an absolute bargain – amazing fresh sea food straight from the sea we had been swimming in hours earlier. We even got a cab called for us as it was a typical British Summer evening – sideways rain!